OK, it's March and time for a new book to discuss! This month, we will feature Misery! 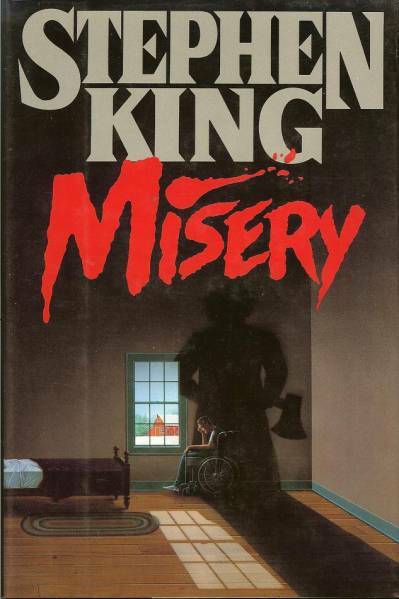 Misery wasn't the first Stephen King book I read, but I absolutely LOVED it! I read it in high school and one of my friends was about 100 pages ahead of me. He and I used to talk about it at school everyday. The helplessness of being injured and trapped somewhere seems to be a recurring theme for King. Did you like it? Let's discuss! I thought the new commercial they put out is hilarios. The book was a fast read, but very graphic. It's been along time since I read Misery but I loved it. Annie Wilkes is a totally believable character and is one the best SK has ever come up. Also loved the film version of the book. The scene where Annie breaks Paul Sheldons two ankles was unreal. The sound of the bones breaking and Paul begging her not to still sends shivers down my spine when I think about. Misery was published in 1987. It was #4 on the Fiction Bestsellers list that year. Tommyknockers was #1, and The Eyes of the Dragon was # 10-quite a good year for King. Approximately 900,000 First editions were printed. First off I'm sorry I couldn't find any fantastically negative reviews with bold, outrageous comments. The few that did start off with a negative slant had by the end still praised Stephen King's Misery. Probably the first review published off Misery was in Publisher's Weekly, May 1, 1987. Not surprisingly Publisher's Weekly praises King's work here, and part of that probably comes from the fact that he sells so many books for these publishers. The first line especially grabs you, "King's new novel is unadulteratedly terrifying." As do most reviews, Publisher's Weekly then gives a couple paragraph review of the book. One thing they particularly seem to like is King's use of the novel within the novel, as his lead character composes a novel during Misery. "Studded among the frightening moments are sparkling reflections on the writer and his audience, on the difficulties, joys and responsibilities of being a storyteller." The main character of Paul Sheldon is seen as a type of King himself as King expounds through Sheldon many of the parts of writing. They love the development of the two main characters, and surprisingly they end with this quote, "The best parts of this novel demand that we take King seriously as a writer with a deeply felt understanding of human psychology." No negative slant here, only a praise of Misery and King's developing writing sense. The next review is no doubt a very influential review as it comes from Sunday, May 31, 1987 New York Times by John Katzenbach. Katzenbach at first expounds on the prolific nature of King in his writing and refers to his ability to take his books to the top of the charts. Katzenbach though looks at this development in a strange way, though. He isn't resentful of King for his selling, but sees the money he makes overshadowing the actual writing going on, "It is easy to lose sight of the realization that "Misery" is a novel that would probably demand considerable interest even were it not from the writing phenomenon that is Stephen King." Katzenbach sees Misery as standing apart from the "normal" King horror novel. He designates the character development of the two main characters and the cliffhanger that supports the whole narrative of Wilkes torturing her idol, Sheldon. Katzenbach definitely takes this work seriously, "He(King) delves deely into the psychology of creation, and it is to his credit that much of the tension in the book stems from the devilish dilemna the author-hero discovers." Katzenbach is delighted by the character and dilemna of Paul Sheldon. He sees Misery's strength not in its truly frightening nature but in the reality of the situation and the delightful writing of King. 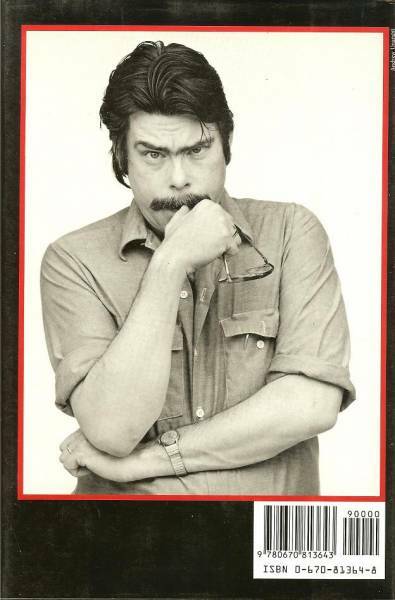 I'm sure that this review helped King sell a few copies of Misery to some literary bigwigs that normally wouldn't touch it. Another influential review comes from Carolyn Banks of the Sunday, June 14 Washington Post. She sees the character of Sheldon and his writing as heavily autobiographic by King. But in a description I had not seen yet she also describes it as his most funny novel to date. She admires the "round character" of Annie Wilkes and enjoys the frightening humor she begins to the situation. Banks also feels that Misery is frightening not only because of King's horror touch, but also because of his creation of deep characters and the horrible things that happen to them. She also praises his use of the art of writing in the book, "In addition to being able to scare the reader breathless, he is able, in this book, to say a tremendous amount about writing itself, about its "deep and elemental drawing power, its letdowns, its challenges." Banks loves King's placing of much of himself in Sheldon and how he exploits this to take humorous shots at himself. Once again this sounds like a reviewer who for the first time really delighted in the writing of King, not just his ability to keep you reading in terror page after page. On a different note I come to the review by Karen Libatore in Friday, May 29 edition of The San Francisco Chronicle. He sees King's portrayal of the suffering of Sheldon as a metaphor for King crying about his condition as he rakes in the dough for his bestsellers. Liberatore is definitely reacting against King's success, and feels it should reel in his critical comments because of that success. This is not to say that she didn't enjoy the book, "Misery is a great and offensive horror story with terror that builds on a frightening sesne of being there. It's as good as King gets." However much she enjoys King's novel, Liberatore has to take a negative slant at times because of what she perceives as King's whining. While all of the reviews sounded astounded by the money and book sales King had, Liberatore was the only one that I saw let it affect her review. She delights a little in the self-conscious jabs that King makes at himself, but can't get over his perceived whining. These are a handful of the most influential or exciting reviews I could find. I'm surprised the header to one of these reviews didn't read, "Gasp, Stephen King really can write." This novel, if you believe the reviews prove that Stephen King is not just a gore writer. Many reviews point out that he explores many of the themes of popular literature through the years and also utilizes many of them in his novel, Misery. Most of these reviews paint the picture of the novel as not as scary or frightening as King's previous works of horror. Rather they describe it as a great development of the two central, and basically only, characters, Paul Sheldon and Annie Wilkes. It seems a jump up in ability seen from King for most of the reviewers. They all are amazed at his success in monetary terms and in the writing of his book. On the whole they are very positive, and all the stuff I've ever seen on Misery seems to paint it as if not the best of King's work, then definitely up there with the likes of "The Shining" or "It". A couple of strange things popped up in the reviews such as The Boston Globe's mistaking the name of Paul Sheldon as Paul Leonard. Or some reviews claim that Sheldon wrecks in Wyoming while others say he wrecked in Colorado. In conclusion, I was not surprised by how positive the reviews were. Ray Murphy, Boston Globe. June 14, 1987. John Katzenbach, New York Times. May 31, 1987. Carolyn Banks, Washington Post Book World. June 14, 1987. Karen Liberatore, San Francisco Chronicle. May 29,1987. Sybil Steinberg,Publisher's Weekly. May 1, 1987, p. 52. I've always enjoyed King's description of Sheldon's pain in the aftermath of his accident [the whole waves crashing against the piers thing]. As a chronic migraine sufferer, I find myself thinking of that passage more often than I would like. Good choice for book of the month Odetta! This will be fun. I think Annie Wilkes is one of SK's best characters. I finished Misery a few days ago. I went into it with a feeling of thinking it will just be “ok”. Don’t ask me why. Annie Wilkes is absolutely brilliant. I have to agree with you. I only finally read it a year or so back and ended up enjoying it much more than I expected. It even made me want to check out more King books that I had previously avoided since I had seen the film versions.